Just when we thought this story couldn’t get any more exciting – there’s a possible surprise twist! Last week, one lucky Sierra Nevada couple was walking their dog when they stumbled across a gold mine. 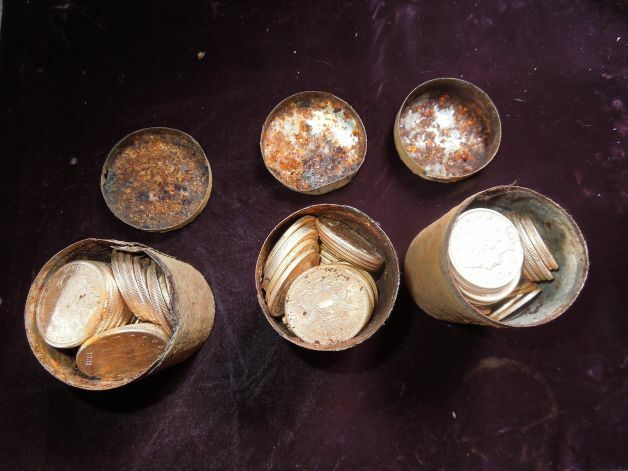 It wasn’t an actual gold mine, but instead gold coins – 1,427 gold coins to be exact! Since then, the discovery, dubbed the Saddle Ridge Hoard, has rocked the rare and collectible coin world, in addition to nearly starting another gold rush. This is because the coins, the oldest of which date back to 1847, are in mint condition, extremely rare…and worth close to $10 million dollars. Renowned coin dealer Don Kagin and his senior numismatist, David McCarthy, were some of the first to examine this modern-day treasure. At first, the seasoned experts couldn’t even believe what they were seeing. Of course, after finding such an amazing discovery, many were curious about where these coins came from. Which brings us to the newest and most exciting possibility of the gold’s origin – a gold heist. Jack Trout, a historian and rare coin collector, recently dug up an old newspaper article from January 1, 1900, which describes a robbery of the San Francisco Mint vault. The thief stole $30,000 worth of gold, an amount that’s surprising close to the $27,980 face value of the discovered coins. The coincidence is undeniable, and a very shocking twist to this miraculous story. However, despite the fact that the coins were never circulated and that most of them were “minted in San Francisco,” not everyone believes this latest theory. Since the announcement of the coins, hoards of people have contacted the couple’s coin dealers, trying to provide a history for the coins and stake their claim on the $10 million. Tales of Jesse James, Black Bart, stage coach and train robberies – every idea possible has come forth. While this newest theory is more likely than the others, it is what it is – a theory. “It wouldn’t be a mint robbery if it didn’t have coins from at least the previous seven years, and the most recent coin in the hoard is from 1894,” said Kagin. It looks like the mystery of the Saddle Ridge Hoard will never be solved. However, that hasn’t kept people from discussing, dreaming, and even digging for gold again. While it’s unlikely that most of us will find hidden treasure in our backyard, you can ensure your future does have a golden outlook by adding physical gold to your retirement account. The process is tax-free, hassle-free and it only takes a few minutes to get started. Call American Bullion at 1-800-326-9598 to set up your own gold IRA and start building your “buried treasure” today. Black Bart? Jesse James? Who Hid $10 Million Worth of Gold?